1. Preheat oven to 350 degrees F (325 degrees F for convection) and line muffin tin with papers. 2. In a large bowl, beat together butter and sugar. Add one egg at a time, beating after each addition. 3. Mix in cream-style corn, olives, chorizo, and Manchego. 4. In a seperate bowl, stir together flour, cornmeal, baking powder, and salt. Stir the dry mixture into the wet mixture until even. 5. Spoon into 24 muffin cups, roughly 4/5 full. Bake for 22-25 minutes or until a toothpick comes out dry. posted by jessica	at 08:55 AM	Filed under Inventive, Recipes. You can follow any responses to this entry through the RSS 2.0 feed. Both comments and pings are currently closed. Yum! 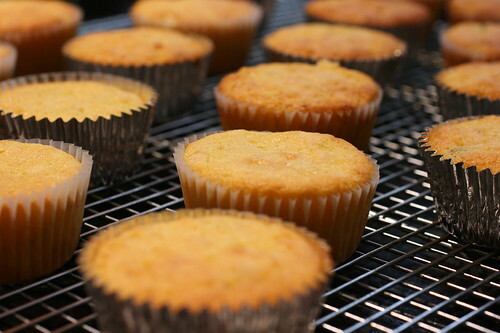 I love warm, home-baked corn muffins. Asianmommy, how about warm, home-baked anything? Grace, it was difficult. I had to keep telling myself, there’s always tomorrow. Alright, so green olives, chorizo and manchego cheese are some of my favorite flavors in the world! Either I’m coming to your house to eat your food this week or I’m going to have to make these… And I agree with grace–eating only two is a miraculous feat! I love these muffins. With chorizo, manchego, and olives — these look killer! 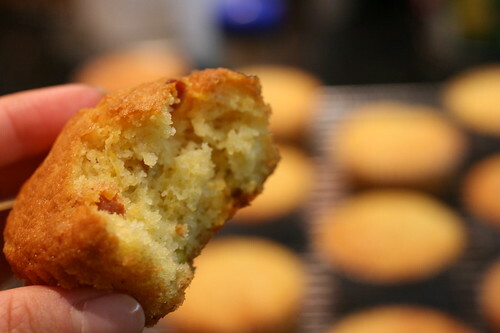 JS, they’re pretty plain looking from the outside, like a regular corn muffin, but it’s a nice flavor surprise. This reminds me of what I got at Baked. But this looks much better. I would have rather eaten yours. Oh my gosh! This looks absolutely incredible!! This looks fabulous! I love chorizo, never thought of adding it to muffins though. Thanks Fearless kitchen. Sometimes I feel a bit more adventurous. thank u so much for a great recipe! I really enjoy your website very much!